Also Called: Smooth solomon's seal. Stems: Erect to slightly arching, slender or stout, unbranched, leafy, glabrous. Leaves: Alternate, simple, 2-ranked, lance-elliptic to broadly oval, 3 to 8 inches long, 1.2 to 3.6 inches wide, glabrous, green above, blue-green waxy below, 7 to 19 prominent parallel veins; margins entire; tips pointed; sessile to somewhat clasping. Inflorescences: Cluster of 1-6 flowers drooping from leaf axils on stalk .5 to 1.5 inch long; each flower on nearly equal, slender, individual stalks 1/8 to 1/2 inch long. Flowers: Greenish-white to cream, .6 to .9 inch long; perianth segments 6, 1/2 to 3/4 inch long, inner and outer segments united in cylindric tube; tip 6-lobed; stamens 6; filaments smooth, slightly flattened; stigma obscurely 3-lobed. Fruits: Berry, spherical, 1/4 to 3/5 inch in diameter, dark purplish; seeds several to many, 1/8 to 1/6 in diameter. Habitat: Moist deciduous woods, thickets, stream banks, roadsides, and moist prairies. Uses: The rhizomes are high in starch and were boiled and eaten by Native Americans. A flour was made from the rhizomes and used to make bread and the roots were steamed and inhaled to treat headaches. The roots were also burned for the pleasant fragrance. Young shoots were boiled, fried and eaten. Roasted rhizome fumes were used to try and revive unconscious patients and the liquid from steeped roots was used to treat coughs and applied to cuts, sores and bruises. The plant was also used medicinally to treat dysentery and lung diseases. 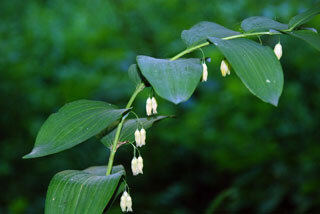 Comments: Solomon's seal has a thick, jointed, horizontal rhizome. The stem breaks away from the rhizome in the fall, leaving a conspicuous, circular seal-like scar. One legend relates that King Solomon placed his seal on the rhizomes to highlight their medicinal value. A German tale relates that Solomon used the rhizomes to magically split the stones used to build his temple. Herbals from the 16th Century claim that the roots were used to "seal" fresh wounds. Polygontum is derived from Greek polys "many" and gony "knee", in reference to the jointed rhizome.